The U.S. is becoming a net exporter of natural gas for the first time since 1958, a boon to the nation’s balance of trade and a bragging point for the Trump administration but a source of concern for industrial gas customers for whom cheap gas has sparked a resurgence in U.S. chemical production. The historic shift is the result of both increased pipeline shipments to Canada and Mexico and the expansion of LNG export capacity. 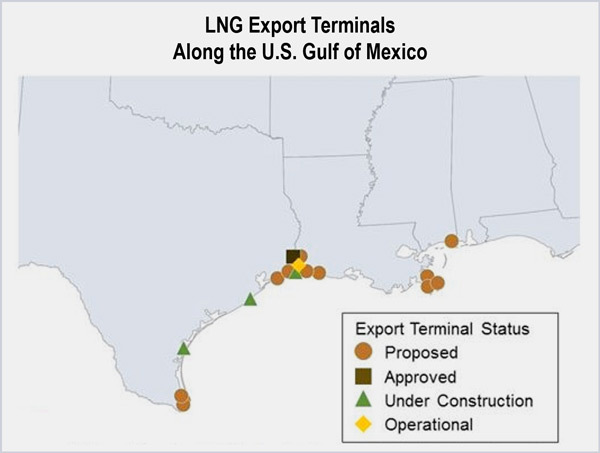 The opening in February 2016 of Cheniere Energy’s Sabine Pass LNG export terminal in Louisiana — the first export facility in the lower 48 states — helped push the country from being a net importer of natural gas to a net exporter for four of the first six months of 2017, according to the U.S. Census Bureau. The U.S. ranked 16th in LNG exports in 2016, with only a 1.1% market share. 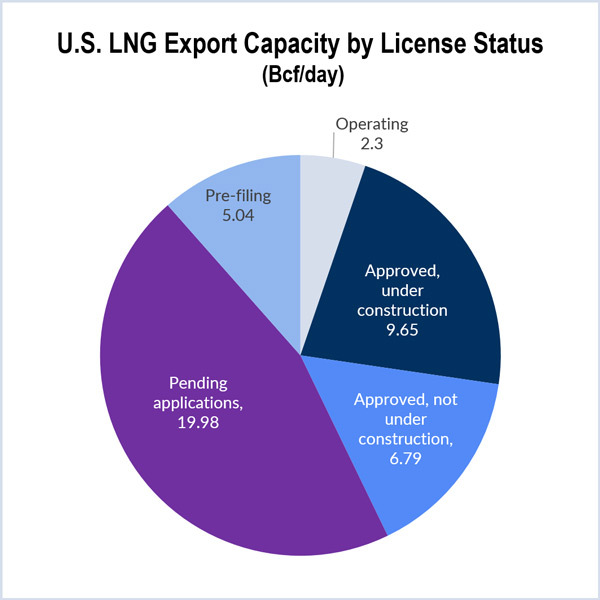 But about half of global export capacity under construction is in the U.S.
Sabine Pass and the only other existing export terminal in the U.S., ConocoPhillips’ Kenai LNG Plant in Nikiski, Alaska, have a combined capacity of 2.3 Bcfd. An additional 11 other terminals with a combined capacity of 16.4 Bcfd have been approved, and 14 terminals (25 Bcfd) have pending applications or are in the prefiling stage, according to FERC. The Trump administration has pushed to expand LNG exports, particularly to European Union countries dependent on Russian gas, continuing an Obama-era policy to counter Russian influence. Russia supplied more than one-third of Europe’s gas in 2016 and is expected to remain its biggest supplier through 2035. Although some government strategists find U.S. shale gas wealth appealing as a geopolitical lever, economists say exporting too much gas could expose U.S. consumers, industrial users and electric generators to much higher world prices. Australia’s surge in LNG exports provides a cautionary tale. The country, which exported 62% of its production last year, was hit with a February heat wave that resulted in gas shortages and blackouts. Chris McGill, vice president of policy analysis for the American Gas Association, which represents more than 200 gas utilities, is unconcerned. John Shelk, CEO of the Electric Power Supply Association, said independent power producers aren’t concerned by an increase in exports influencing electricity prices either. “We agree with our producer colleagues that the supply curve is so flat that any increased demand from LNG exports going up can be met without a meaningful uptick in prices,” he said. But the Industrial Energy Consumers of America (IECA) is alarmed by the trend. The group, which represents companies with 2,600 facilities and 1.7 million employees, issued a statement in July disputing Trump’s boast that the U.S. is “sitting on massive” energy reserves. It called for a moratorium on further approvals of LNG exports to countries without free-trade agreements (FTAs) with the U.S. 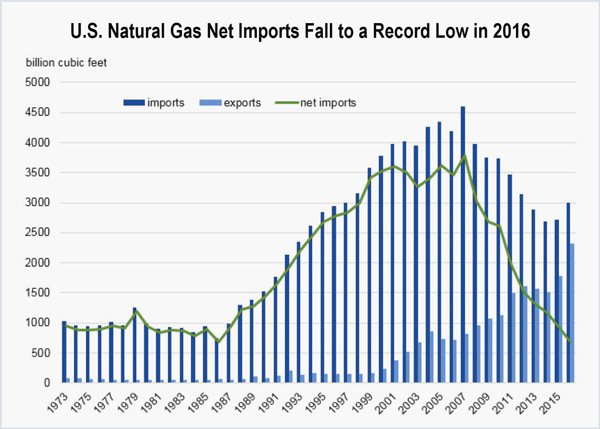 The Natural Gas Act of 1938 stipulates that the U.S. Department of Energy must approve any requests to import or export gas based on whether it is in the “public interest” — a term it has never precisely defined. Under the Energy Policy Act of 1992, trades with countries that have FTAs with the U.S. are automatically considered “consistent with the public interest and granted without modification or delay,” according to the department. Two bills introduced in the Senate in June would expand that blanket authorization to countries without FTAs, except those under U.S. sanctions: the License Natural Gas Now Act, proposed by Sen. Bill Cassidy (R-La. ), and the Natural Gas Export Expansion Act, by Sen. Ted Cruz (R-Texas). Cassidy said his bill is supported by industry groups including the American Petroleum Institute and the Natural Gas Supply Association. IECA said it opposes the Cassidy bill. Last week, DOE proposed automatic approvals of gas export applications of up to 140 Mcfd as long as the applications do not require an extensive environmental review. DOE has delegated to FERC the authority to conduct environmental and safety reviews of proposed LNG facilities, but not to block exports on broader policy grounds. In April 2016, the American Chemistry Council (ACC) called the U.S. “the most attractive place in the world to make chemicals,” saying cheap gas was responsible for 264 U.S. chemical industry projects totaling $164 billion. By 2023, the group said, the spending would result in 69,000 new chemical industry jobs, 357,000 jobs in supplier industries and 312,000 jobs in neighboring communities. By contrast, IECA notes that LNG export terminals only employ a few hundred employees each. Notably, 55% of the projects cited by the ACC were then in the planning phase, making them vulnerable to cancellation if gas prices rise too high. Unlike IECA, however, the chemicals group expresses no fear of LNG exports. The ACC told RTO Insider that it stands by its 2013 statement opposing any new export bans or restrictions on LNG export terminals and supporting “free-market policies that promote the export of American-made goods, including” LNG. The industrials group is aware that ACC’s position seems to undermine its concerns. 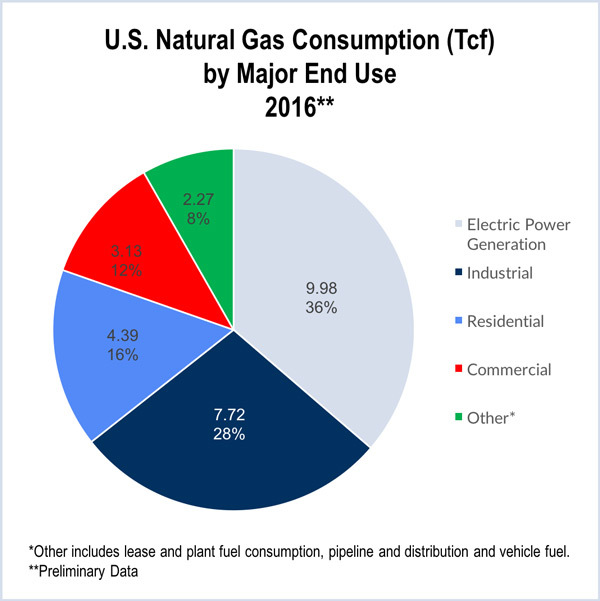 According to EIA, power generation led the demand for U.S. natural gas in 2016, responsible for 36% of consumption. Industrial consumption was second (28%), with demand driven by petrochemical producers — who use natural gas as a feedstock in the production of methanol, ammonia and fertilizer — and other energy-intensive industries that use natural gas for heat and power. EIA predicts gas use in power production will briefly decline because of growth in renewables and price competition with coal, before increasing after 2020. The increase is based in part on the scheduled expiration of renewable tax credits in the mid-2020s. However, the reference case also included fuel switching to gas because of EPA’s Clean Power Plan, which President Trump has vowed to cancel. Natural gas consumption in the electric power sector is about 6% higher in the reference case in 2040 than the “No CPP” case. Neither Congress nor the DOE has defined the “public interest” for making decisions on exports to non-FTA countries; instead, the department has used guidelines developed in 1984 for LNG imports, according to a 2014 Government Accountability Office report. The industrials say the department should define the public interest to recognize job impacts. IECA says using natural gas in manufacturing creates eight times more jobs than exporting it. Domestic industrial use is worth twice the direct value added per year and 4.5 times the direct construction jobs, IECA says. “The most glaring omission and failure of the Obama administration [public interest] studies was to cumulatively account for increased LNG exports to both NFTA and FTA countries. The studies only considered the impact for volumes to NFTA countries. More than twice the volume is approved for FTA countries and these volumes, in addition to domestic demand, were not included in any of the studies,” IECA said. The group recommends the government allow existing LNG export terminals approved for shipment to non-FTA countries to become operational and determine if the gas industry can increase production, pipeline transportation and storage capacity without price increases or supply shortages that would damage the U.S. economy. “DOE should implement its authority under the Natural Gas Act (NGA) to establish a process of ongoing monitoring of economic impacts of LNG export volumes, and with the ability to reduce LNG export volumes for purposes of establishing a safety valve for U.S. consumers and the economic welfare of the country,” IECA said. FERC approved the Atlantic Bridge pipeline project, which will expand natural gas delivery capacity in New York and New England.